We were a four-person team, one woman and three men, expecting to finish in twelve to sixteen hours. If you’ve never done a long relay race where you participate multiple times, especially through the night, you’ve got to experience it. It’s amazing for the camaraderie and sheer physical challenge. When I’m with my team, doing something I’ve never experienced or perhaps not thought possible or only recently considered, feels more approachable. I’ve done them on road bikes (Texas Time Trials), on mountain bikes (Granny Gear), and now in a swim (English Channel). Perhaps next it’s a long run? It’s a team effort, but once every 2-4 hours, it’s all you. And I do remember the finishes, how we placed, and who we raced, but it’s the scary, challenging, and frequently ridiculous things going on with me and my friends that are the most fun to relive afterward, at least for me. At one point on Friday, hours into our channel relay, it’s bright sun, rolling 6ft swells are tipping the edges of the boat almost to the water, I’m balancing no hands mid-deck like I might on the subway except that with the severe rotation my knees almost touch my armpits, Christian is in the channel powering through the waves like a machine, Beate is on her knees retching into a bucket, Ina and Mo are rising and falling almost their own height as they hang onto the railing, keeping eyes on Christian but with their left arms straight out to the side to signal to him 15min, while Sam the first mate does a drunken-looking sideways yo-yo of a walk across the boat just to show off. Quite a picture, and not one you’ll see on Broadway. At 1pm Thursday, Mo and I are headed out of Dover on foot, looking for a river and an old flour mill, when we get the call from Kate that we might be swimming that night at 1030pm. Holy Sh*t. The winds are changing hour to hour the boat captain says, and our last chance at this relay is the next 36hrs. We’ve been waiting ten days for good conditions, and now we find out that beyond this window of a day and a half we’ll be ‘weathered out’, losing half our boat money, plane tickets, and twelve days of lodging, not to mention that we’ve spent this time in Dover, England and not in Palau. Also, dinner will be at five and we should pick up whatever supplies we might need for the crossing on the way home. We buy a loaf of bread, a bottle of coke, an extra jar of ‘peanut spread’ (British version of the crucial ingredient), and another 1.5L of water. Before I’m 20sec into the conversation with Kate however, I’m already getting mentally preparing to swim at 12:30am and 4:30am (we’d previously determined our order: Matze, Christian, me, Kate) – these will be my first night swims ever. Dinner is quiet, like we’re all hiding from something, but really we’re just waiting for Paul Foreman, the captain, to call us to confirm when we’re swimming. He phones, and to our great relief, he says we won’t leave until twelve hours later, at 10:30am the next morning. We had all raced home earlier to pack, so we’re pretty much ready, and now we can relax, read a bit, and get a good night’s sleep. I’m reading Huckleberry Finn, and the Adventure part, in the middle of a wild river, seems about right for this moment. I must admit that everything from the time I wake up to my first swim seems lucid but surreal. I’m there in shape and form but I’m not saying much, trying to make conversation at breakfast, on the boat, on the way to the start, but literally I can’t recall a single thing I talked about with anyone. It’s like a silent film I’m inside of – except for the wind – and that I can hear and feel and taste. We motor out of Dover Harbor and make the big right turn to Shakespeare Beach where we’ll start our crossing. Matze begins stripping out of his clothes while Ina, his wife, opens a container of Lanolin mixed with Vaseline. He has it mixed at a drugstore and the joke is that all the women ask him what he’s using that for? He answers that it eliminates friction for over twelve hours, but that he can’t say more. It’s a white paste and Ina dons rubber gloves, scoops up a glob, and smears it over his neck and armpits. He has goggles on so you know he’s swimming, but unless you’ve done multi-hour swims and experienced those skin burns, the rest of his war paint would be a mystery. Paul puts it in reverse and gets us within forty yards of shore. Matze is moving with a purpose now: he’s down the ladder and swimming to shore, crawling out, shaking hands briefly with our gracious hosts from the Sandown B&B who have come to see us off, getting the signal from Laura, our Channel Swimming & Piloting Federation observer, that everything is in order, and diving back in the water. Soon he’s on the right side of the boat swimming along, and he won’t stop until the whistle blows, telling him it’s time to change swimmers. He alternate side breathes so he could swim on either side of the boat, but Paul prefers the right since the captain’s chair is on that side and it’s easier to watch swimmers over there. Christian and I will be on the left however, since we prefer to breathe to the right. I’ve been told I need to swim hard. It’s getting darker by the minute and we’re trying to land on a specific point on the French coast, but the westward current is sweeping us toward the Atlantic at a blistering pace. We must swim across this current and get out of it or we’ll add hours to our time. Sometimes people simply don’t make it in, having to turn around within sight of shore. Matze and Christian have just nailed their efforts so I jump in and go for it. I really put some power into the water, and after a few minutes I’m questioning whether I’ll be able to keep it up. I’d hate to fade thirty minutes in and simply slop around for the rest, losing ground. However, to my great relief, I get to thirty and feel great, and at forty-five I’m realizing the hard repeats I included weekly for the final month of training are paying off. However, at this point, every time I breathe, I’m seeing what will be my enduring visual of this, my third swim of the relay: I’m looking up on deck into bright lights and shadows and Kate is getting ready for what will be her final swim. She got me into this and made this relay happen. On the bench at the back of the boat, she’s seated, elbows on knees, shoulders rounded as she looks up and over the boat to the scattered lights in France, silhouetted, glowing against the night sky. A bright green light blinks at the back of her cap and goggles, required equipment so the captain can see her in the waves and darkness. After a few minutes, or ten – it all seems a long time at this point – she stands, signaling that she’s going in, and my swim is over. I emerge spent, but very happy with the effort. We’ve moved closer still. When it’s all over I wonder if I could have swum this hard all day, but I think I would have been cooked. On deck, Mo is helping me as she has all day, getting me dry, dressed in warm clothes, fed, making sure I’m okay and can lay down to rest. I’m unbalanced and lean on her constantly. Even though she’s been seasick all day, popping Dramamine to stay in the game, she’s there every time. I can’t thank her enough. Christian is ‘bending the line’, and that’s a very good thing. 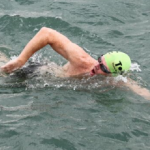 It’s his fourth one-hour swim, he’s cold and tired, and he told me he didn’t think he could cover 4500 meters in the hour – and that’s the distance to France, across the massive current. So he’ll probably be getting out so I can jump in and swim to the coast. I’m watching the green vector on the pilot’s screen slant/’bend’ toward shore. It shows our trajectory, our projected path. The current is mighty here as it sweeps west parallel to the shore; very difficult to swim across, but Christian is our strongest swimmer and he’s been killing it all day, moving our team along when it counts. He’s getting closer, and by the end of his time he’s put me in a great position, about three quarters of a mile away. It’s 11:55pm and the motors are idling – it’s like standing next to a Harley at a stoplight. I quickly slather Aquaphor on my chin and armpits, lick the inside of my goggles, check my reflection in a narrow piece of chrome to make sure my two green lights, one dome-shaped and blinking on my goggle strap and the other long and narrow tied to the tag in my trunks, are on. No need to drift out of sight in the cover of night. I flip around to face the boat and make my way down the ladder to the varnished wooden platform at the bottom. It dives deep into the water and then jumps out again as the boat is tossed about in the waves. Mattias, the only person on our team who’s ever swum the channel solo, tells me later that if he’d done this relay first, he would not have attempted it on his own – the seas we’ve seen today are too rough to contemplate swimming in for fifteen hours or more. To that point, all the boats today carry relays, no solos. They are calling Christian in and I watch him paddle over. The observer yells for me to jump back and swim around. It’s a direction and a warning: if we touch one another in any way, our team is disqualified within a stone’s throw of France. It’s now 12:30am, I’m swimming the 15th hour of our relay, and I know I’m close. Kate yells from the boat and I stop to see if it’s time. Most everyone is up on deck: Mo, Ina, and Beate who’ve been supporting us all day, my teammates Christian, Matze, and Kate, and Laura, the CS&PF observer tasked with making sure every rule is followed so the swim is official. All I can see is their silhouettes and the blinding spotlight that’s been on me the last two swims due to total darkness. I’d already discussed the details of this moment with the captain, Paul Foreman, so I know some of what’s coming, but I had no idea what it would be like. “Swim to the light!” Kate yells, and I glance quickly out to the shore and back to her. “What’s out there?” I yell, wanting to know what I’ll be swimming into, but all I get back is, “We don’t know. Just swim to the light.” It’s jet black with a huge moon directly behind the point I’m swimming toward, so I can see a treetop outline, but nothing more. Just the sound and ripple of the waves in front of me over what I think is around 100yds of water. I haven’t seen a fish or been stung by a jelly all day, but for some reason I’m skeptical of what lies beneath this shallow, inky water. I feel exposed every time I reach out for a stroke, like there’s an eye down there looking up at my belly. Sam, one of the crew, has a spotlight aimed at a point on shore, a ghostly white palm pressing against nothing, hovering below the moon. I swim hesitantly – a couple breast strokes, a couple free, and a glance back at the boat lights receding into the night. I wonder if I’m being overly dramatic. I decide yes, I am, but that’s cold comfort now. I sight again and think I can see a beach beneath the trees. Sh*t! My hand hits something hard, sharp, and unmoving. I reach out with my other hand to feel it and see what I’m up against, realizing I’ve now become an explorer since there’s a beach to get to and no one around to help me no matter what it is. I quickly recognize by feel (I can barely see the surface let alone what’s beneath it) that it’s a coral formation, the last thing I expected to find, but the worst thing possible. I look across the water toward the shore, perhaps thirty yards away, and see nothing breaking the surface. Now I’m literally worried about my own skin. Feet dangling, I halfway hold myself up out of the water over the coral and look back at the boat but I don’t hear anything. There should be cheering if the observer has said the crossing is complete. So I lower myself down into the water and move forward with some tentative breast strokes. But about the time I press out with my hands, lift my head, and make out some coral above the water near the shore, I run my chest right into more coral. Feeling the long scrapes, I know I’m cut up, but I’m okay, and thinking I can probably make it to the beach. But can I make it back out? How far do I have to go? I’m supposed to be standing on shore with no water behind me. I realize one foot is on solid ground of some sort, so I search for other footing, and find it between the two coral heads I just ran into. I start to stand up, briefly reminding myself I better not fall back, and raise myself out of the water and lift my hands high. And I hear the cheers: our team has made it to France from England. I decide I’ll enjoy the feeling later, and concentrate on getting back out to deeper water with no unexpected collisions, which by dumb luck, I do. Later I realize, that after standing, I never looked back at France. Back on the boat there are cheers and congratulations all around. Mo and Christian get my wounds cleaned and dressed, and we immediately begin the three hour passage back. I find out that the boat ran aground on some of the same coral I beached myself upon, damaging one of the props, but it’s still operational. Paul, our captain, in all his years doing channel crossings, had never landed at this place on the coast. There’s just no predicting it. Almost at once, and I do mean within one or two minutes of me climbing aboard, bodies begin to fill every seat, floor, and bunk, as everyone on board passes out after sixteen hours without a break. I collapse into a seat in the main cabin and glance around. Paul is sitting side-saddle with his feet under him driving the boat as he has all day, the green glow of instrumentation like fluorescent powder over his face and shirt. Up the spiral stairs and through the door to the deck I can see Ina, Matze’s wife, sitting against the bulwark bundled up against the cold salt winds – she told me later she just liked it up there. Sitting on those stairs with her head against the hand rail, Beate looks as peaceful as I’ve seen her given that she’s been violently seasick for thirteen hours and never once left the deck or took her eyes off of us swimmers. My wife Maureen is curled up in a bunk downstairs trying to sleep off her own knotted stomach. We were always looking for these three on deck to cheer us on and give us the predetermined signals for how much time we had left to swim, and once we clawed our way out of the water shaking from the cold, to dry us off and get us into warm clothes and give us a warm drink. You don’t do a relay without the support of caring people, and they were ours. Myself, I eventually wander down to the bunks and, finding them filled, procure a place on the floor. Lying down feels marvelous. Around 4am we arrive back in Dover, where our host is there to meet us, making two trips for us and all our gear. Wired but exhausted, Mo and I pass out, only to rise three hours later for breakfast (can’t miss even one full English breakfast), a final swim in Dover Harbor, and a nine hour drive to Edinburgh to rendezvous with my parents.